Twenty classrooms for elementary school (four classrooms per grade). Typical classroom can accommodate 20-25 students and is equipped, apart from the standard equipment, with an interactive board, a projector and a wall screen. 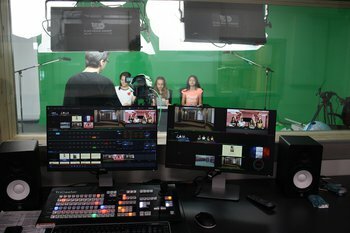 Combo rooms are designed across the school to accommodate up to 50 students with 2 faculty members who teach a combination of 2 courses (e.g. Language Arts Social Science) with the goal to enhance interdisciplinary approaches to learning and increase collaborative instruction. Learning Support classrooms - used by the Optimal Learning program - are specially designed to support differentiated learning for students who require the attainment of academic skills so as to better perform in the educational setting. The small group classroom instruction and cooperative learning activities are incorporated within the student’s curriculum in order to complement various learning abilities. The Hasib J. Sabbagh Library is the main library of ACS Athens for the Middle School and Academy. After a number of recent rennovations, the Sabbagh Library at ACS Athens has expanded to become a model of innovative library space for International Education around the world. The Library's revised role and design accommodates, supports and houses most - but not all - of the Learning Commons activities. Math & Science Studio: The Math/ Science Studio, located at the 3rd floor of the Sabbagh Library, offers Middle school and Academy students personalized assistance in Mathematics, Physics, Biology, Chemistry, and Environmental Systems and Societies according to their individual needs. can receive help and advice on their Math and Science assignments at all stages of their learning trajectory. Writing & Research Studio: Located at the 3rd floor of the Sabbagh Library, the Writing/ Research Studio helps students realize their full potential as young writers and researchers. Database Research and Literacy Studio: Located at the first floor of the Learning Commons, the Research and Literacy Studio helps Middle School and Academy students find the reading resources they will need to develop a love of reading and the ability to research interesting topics. Incubator Zone: This space on the 1st floor of the Learning Commons and hosts the ISCI (Incubator of Students' Creative Ideas), a student-centered, student-led, student-run, project-based learning initiative using the design process to promote, support and guide students’ creative ideas in all disciplines. ISCI offers the following services: • The opportunity to explore intellectual curiosities • Project Based Learning • After School Assistance Program (ASAP)- Students helping students • Workshops on a variety of topics (Arduino, 3D printing, start ups, Entrepreneurship, etc.) • Summits at ACS Athens and at other schools • Assistance with research or other school projects • Possible funding for endeavors • Study groups, etc. 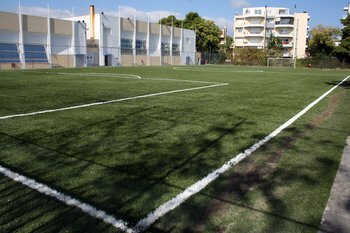 A modern soccer field with a final surface of artificial turf, filled with sand and rubber particles, provides a safe playing area for the students, as per the Hellenic Athletic Federation standards. Along with the soccer field, a new running track has been constructed, according to the standards of Hellenic Athletic Federation. A thick asphaltic layer has been primarily constructed to offer a good foundation to the track, followed by a rubber layer of 10mm and a final finishing layer of embedded rubber granules. In addition, a long jump facility, including runway and landing pit, is available. Moreover, an area of over 400 sq.m has been resurfaced in the same way as the running track, providing the athletic departments of ACS with a safe multipurpose playground area. A heated 5-lane pool (25m x 12.5m), fully equipped and properly maintained 24hrs per day, according to the standards serves the swimming programs of the school. Water tests are being carried out on a weekly basis by a laboratory and everyday by the pool maintenance team. All our personnel have been properly trained to ensure the maximum safety. Students athletes can use four modern tennis courts in blue and white color lines, two singles and two doubles, which can also turn into a big playground area for the children. The tennis net posts are portable and can be moved aside providing the children with a wide and safe area during their recess break. The turf is approved by the International Tennis Federation. Outdoor facilities include an outdoor basketball and a volleyball court available to the students during their recess breaks and after school. A full-time functional health office serves the school community by providing valuable first aid services in case of incidents or emergencies throughout the day. The health office is equipped with two defibrillators while trained personnel is authorized to use them. 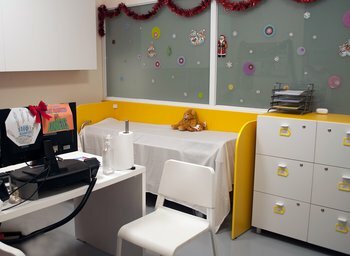 ACS Athens has three emergency huts evenly spread through the campus, equipped with necessary supplies (tools, water, medicine, first aid items, thermal blankets, etc.) to use on a “survive” mode operation, in case a crisis comes up and there is a need to keep students safely in the campus for a short period of time. The campus is certified by the Greek Fire Service and holds an always current certificate. There is an extensive fire fighting system and an advanced fire detection system which covers the whole campus and all critical systems. Through a prompt and accurate alarm system, a fire threat can be detected, a warning signal for any potential risk of smoke or fire is generated, specifying the location of the hazard. The system is comprised by hundreds of addressable smoke and heat detectors, plus sirens and push buttons, evenly spread to all the areas of the campus, capable of securing ACS against fire hazards at the highest grade. The campus utilizes a heating system that has transitioned to natural gas instead of petrol, which is a fuel that causes less pollution to the environment, reflecting an environmentally friendly and responsible approach. The outdoors areas of our campus have been designed and maintained to provide the students with a pleasant environment with many green areas, trees and plenty of grass coverage. 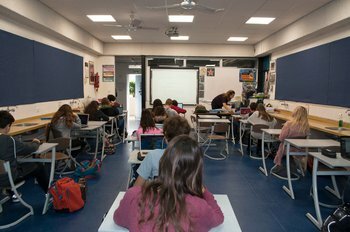 All the light fixtures in our classrooms have been replaced with new high-tech LED panels improving the visibility and significantly raising health and safety standards. The goal is to reduce hazardous fluorescent blue radiation and minimize the ripple effect of conventional lighting.